Two stories, linked to next to each other on Drudge, recently caught my attention. The titles pretty much say it all: â€œHe Likes Trump. She Doesnâ€™t. Can This Marriage Be Saved?â€ (from â€œThe New York Timesâ€, of course!) and â€œUnfriended? Divisive presidential campaign roils Facebookâ€ (from AP). Both are pretty thin and largely anecdotal but where there is a media smoke there is likely to be some fire, however tiny and struggling to hold onto the bunch of moist twigs. I wrote about cross-political dating and relationships a while back, so Iâ€™m not going to revisit the topic, except to say that particularly bitter, ugly, and emotion-charged contests, like the current presidential race, can undoubtedly make the often difficult interpersonal relations even more difficult. Itâ€™s one thing to coexist as generic and theoretical liberals and conservatives or righties and lefties while you share a bed, bathroom and a couch; itâ€™s another to differ when one of you supports the Crazy Donald and the other the Crooked Hillary. 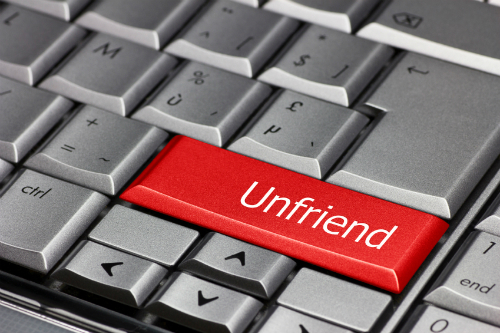 Have you unfriended someone over their politics? I havenâ€™t. Iâ€™m not sure whether this makes me picture book tolerant or whether I simply couldnâ€™t care less. I certainly have a lot of friends who are vehemently for and against Trump, as well as those who support Hillary, or used to fell the Bern, not to mention Libertarian and Green supporters. It never occurred to me to cut them off because of their political views no matter how much I may disagree with them. I would most likely draw a line at (real) fascists and communists (or Islamists for that matter) but fortunately I never have opportunities to befriend those types in the first place. Losing friends on account of politics, to the extent that phenomenon is increasing, is to my mind largely a function of social media. Firstly, because on account of social media (mainly Facebook, but others too, to a lesser extent) we are much more aware of the political and other beliefs of people we know. Our traditional human interactions â€“ business meeting, backyard BBQ, phone call â€“ for most people rarely involve political debates; Facebook, on the other hand, the passive-aggressive medium turns many people into ranting drunk uncles, and everyone else into uncomfortable listeners. Secondly, Facebook tends to increase the number of people we interact with regularly (if by interaction we mean being occasionally exposed to their thoughts and activities in our newsfeed). Many of them are our friends only in the sense that everyone we are connected with on Facebook is a friend. I doubt whether many long-standing, genuine friendships have been falling apart recently because of bitter political differences, if only because we tend to be more tolerant of those we have known longer and better. On the other hand, if someone you once went to primary school with or a friend of a friend youâ€™ve met at some party two years ago continues to rant about Trump or Hillary or the Illuminati, unfriending them on Facebook is hardly a soul-wrenching decision or a meaningful loss for us. Social media makes it easier both to hear others â€“ and to tune them out. Iâ€™ve said above that I have never unfriended anyone over their politics. Has anyone unfriended me over mine? I donâ€™t know. Iâ€™m not narcissistic enough to have one of those smartphone apps that tells you if someone unfriended you. But itâ€™s possible. I certainly have had one friend ask me how have fewer of my Daily Chrenk posts popping on her newsfeed (you go to the top right hand corner of a post, click on a faint down-arrow sign and then choose the top â€œHide Post; see fewer posts like thisâ€ option from the drop down menu). I hope it worked for her â€“ she is still my friend â€“ but please donâ€™t try to follow her example; you will never be able to forgive yourself if you miss that one time I write something funny or insightful.